Hi everyone! 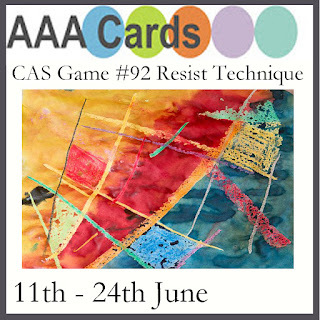 It is time for a new challenge at AAA Card Challenges #92 - Resist Technique. I am so excited to be joining these talented and supportive ladies as part of the AAA Cards design team!! 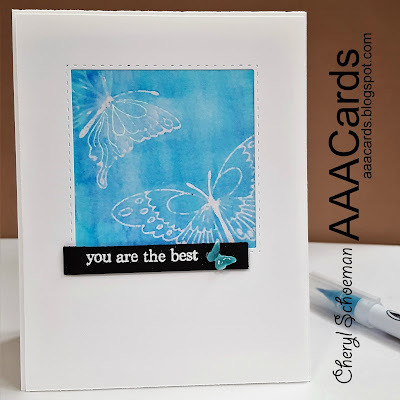 I started my card by stamping the butterflies with Versamark on watercolor cardstock and heat embossing them with clear powder. 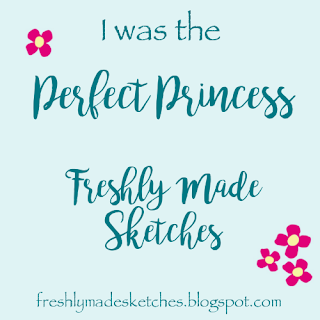 Then I used Zig Clean color markers to scribble over the embossing and used a spray bottle to mist the cardstock and spread the ink out with a brush. 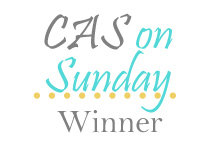 The embossing resisted the color and showed through. Taking a separate piece of white cardstock, I die cut the square out and layered it on top of the butterflies. For the sentiment, I white embossed the saying on some black cardstock, trimmed it out and layered it on top of the square cutout. The butterfly was die cut and then colored it with my Zig Clean color marker and adhered to the sentiment. I put some tiny glue dots behind the wings to make them pop up and added glossy accents to the top. 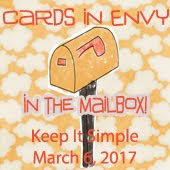 I hope that you play along with us at AAA Cards and don't forget to check out the other ladies' inspiration pieces. They are really beautiful! So very beautiful! Love the delicate butterflies and the vibrant blue background. 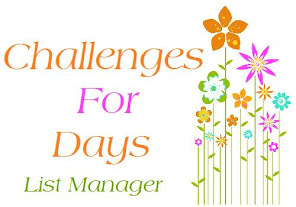 Welcome to the AAA Cards team Cheryl, we're going to have fun! 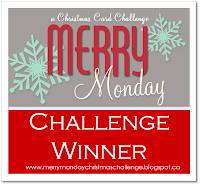 What a pretty card! 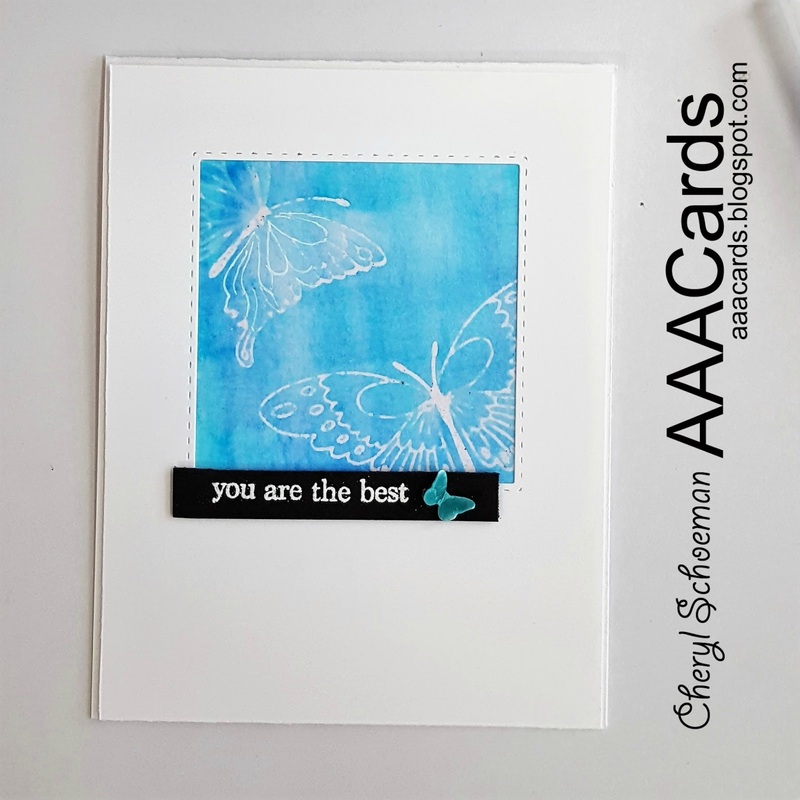 The gorgeous blue background is perfect for those butterflies! I love the butterfly you added to the sentiment - it is so eye catching! 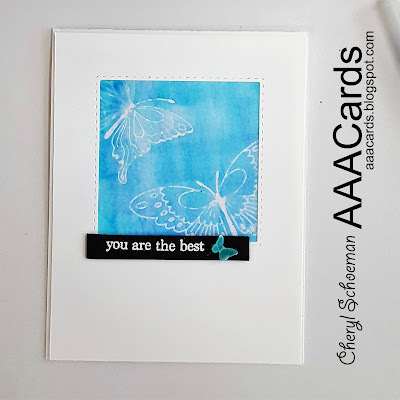 Fabulous card ... the extra butterfly was an inspired idea! I love the window of beautiful blue and the butterflies are lovely! Welcome to the team! 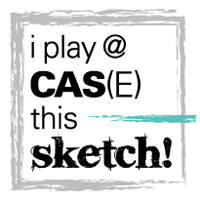 I am excited to be working with you! Congratulations on being a DT on the new team Cheryl! Your white embossed butterflies look fab against the blue background!